Normalizing US rates and higher oil prices have begun to expose persistent macroeconomic imbalances in emerging markets. As returns begin to look more appealing in developed markets, we expect elevated levels of volatility to continue in emerging markets, especially those with large twin deficits, high external borrowing needs, reliance on portfolio flows for financing and low levels of FX reserves. Markets that will weather the new global environment are those with higher levels of policy credibility and the ability to make necessary adjustments. Turkey and Argentina are recent examples that sovereigns cannot escape the arc of adverse fundamentals and incoherent policy. Despite some divergence in underlying economic fundamentals, the roots of the crises in both have remarkably similar origins. 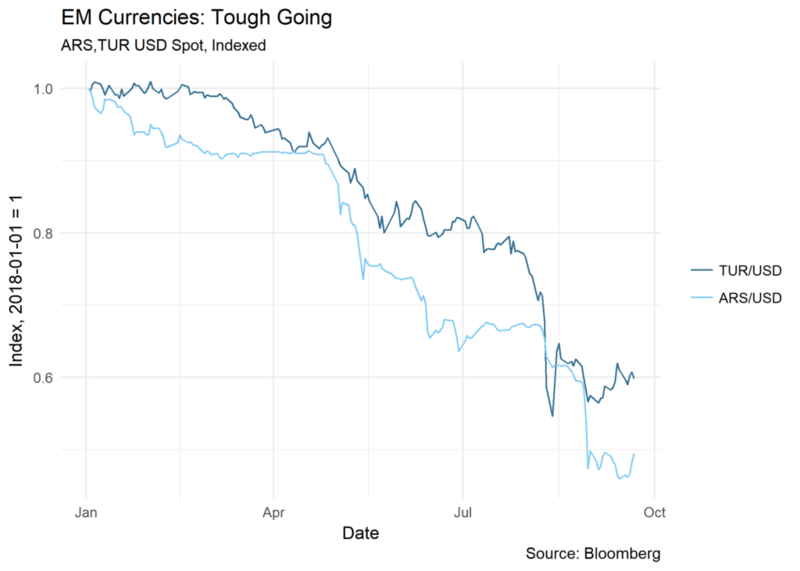 Both the Central Bank of the Republic of Turkey (CBRT) and the Central Bank of Argentina (BCRA)’s credibility to act as an independent arbiter of monetary policy have been undermined by successive administrations. 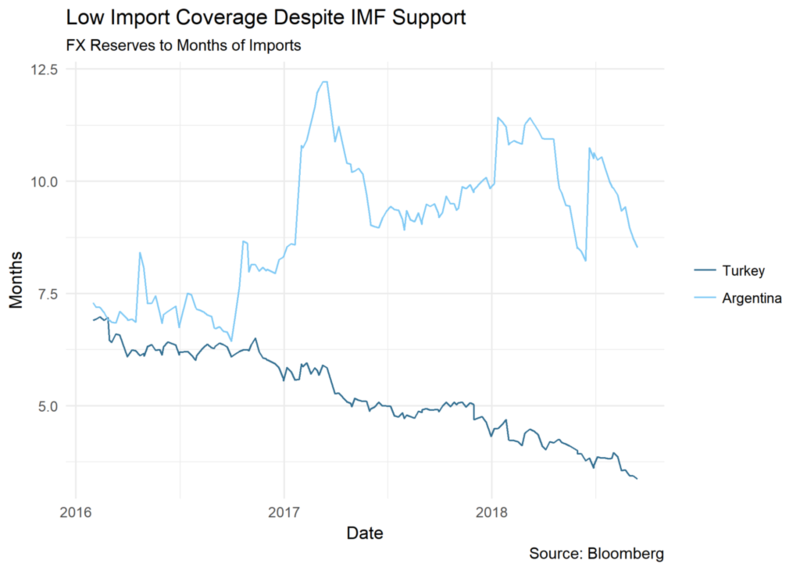 In the case of the BCRA, worthless IOU’s from the government were exchanged for central bank reserves by the Kirchner administration, and investors’ confidence was further shattered by rate cuts in early 2018 after the BCRA’s inflation target was relaxed. 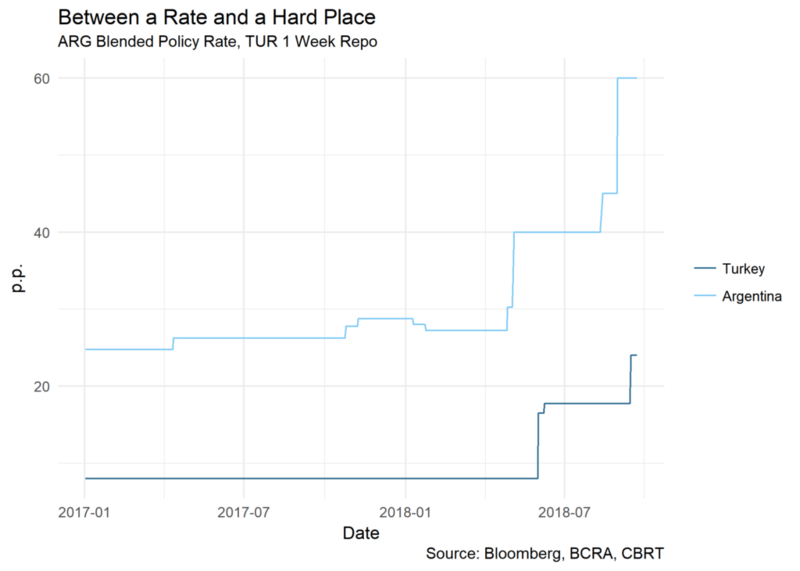 In Turkey, the CBRT’s independence has been consistently eroded by the Erdogan administration, culminating in the appointment of Erdogan’s brother-in-law to a key government ministry and a repeatedly stated preference for low rates. In both cases, portfolio inflows suddenly turned to outflows as investors feared that increased inflation would erode away real returns. These triggers have been coupled with deteriorating macroeconomic fundamentals, and the precipitous decline of Argentinian and Turkish assets this year likely did not surprise careful observers of both economies, with the obvious caveat that hindsight is 20/20. Persistent and sizeable current account deficits have been driven in part by overvalued domestic currencies in real effective terms. Of course, current account and fiscal deficits can be sustainable if the excess of investment over savings is used to finance productive enhancements, but a series of boondoggle projects in Turkey would suggest that this is not the case. Moreover, deficits need to be financed, and research suggests that emerging market countries that are heavily dependent on flighty portfolio flows are particularly vulnerable to rising rates in developed markets. Argentina and Turkey have also been reliant on external debt issuance to finance both government and corporate needs. Although external debt remains moderate in Argentina, the Macri administration has presided over a substantial run-up in dollar-denominated issuance. 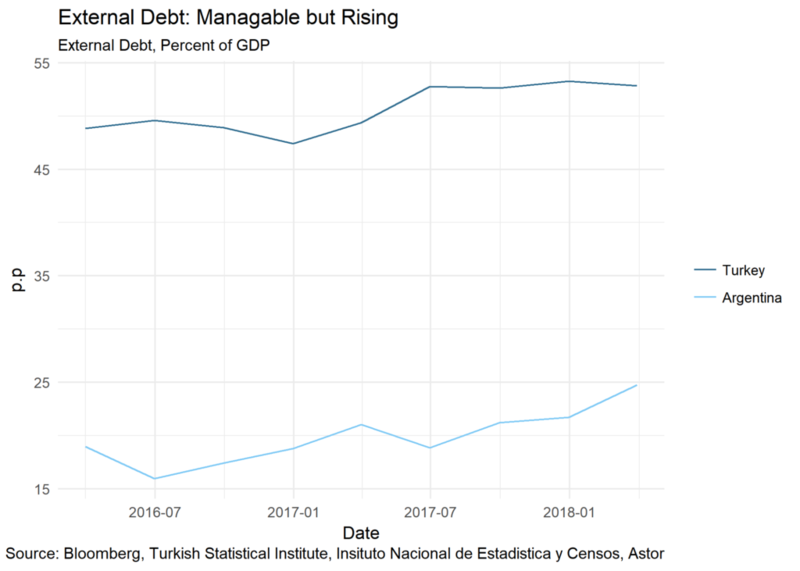 Approximately 70 percent of Turkey’s overall debt is foreign-currency denominated, and Turkish banks are reliant on wholesale external funding to make lira-denominated loans. The respective government responses have been a study in contrasts. Argentina has followed something similar to the orthodox economic policy playbook by increasing rates, slashing government spending and going to the IMF for assistance. The Macri administration was recently rewarded for its effort by a successful issuance of $3bn fixed rate peso bonds, a substantial sign of investor confidence. 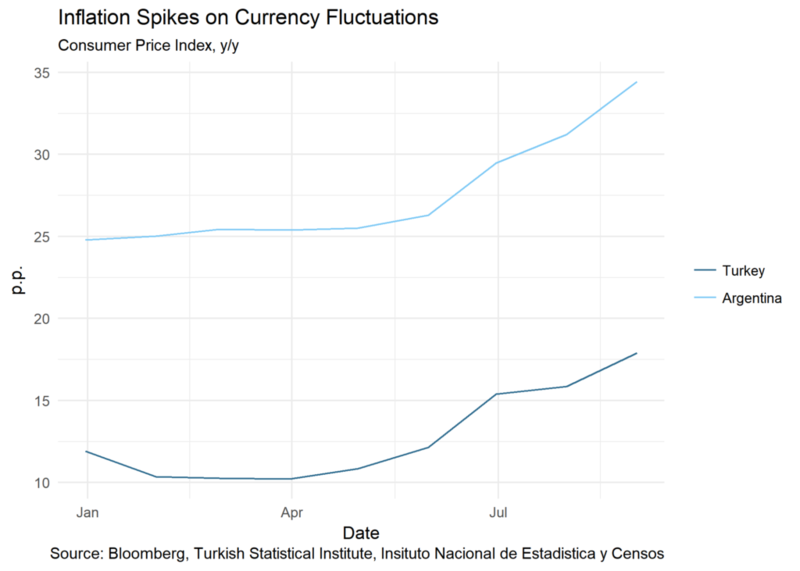 In Turkey, the administration has instead turned to a bilateral currency swap with Qatar and has attempted to curb short-selling. 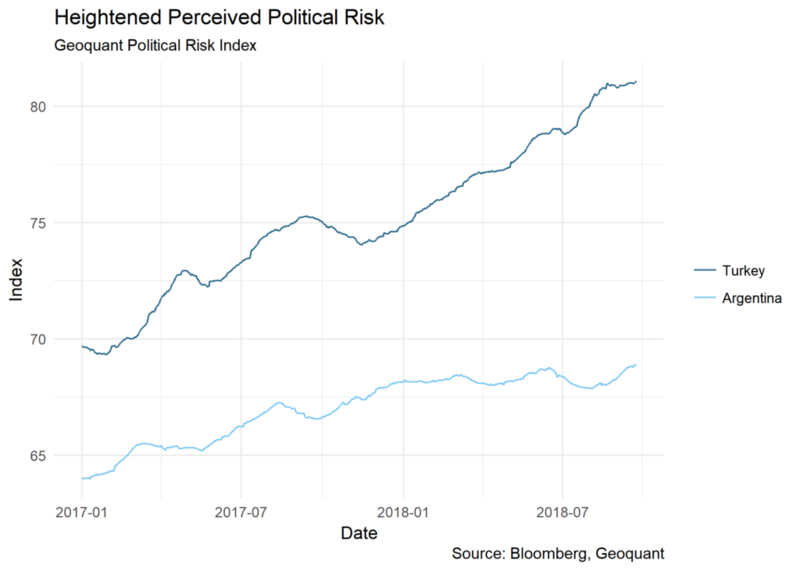 Although rising rates should help arrest the slide in domestic currencies, they are also likely to lead the economy to recession, making necessary government austerity to close budget deficits all that much more painful. Weakened currencies will make exports more competitive, aiding in closing current account deficits and thus reducing financing needs, but increasing the financing burden for existing external debt. Declining FX reserves in both countries will make it more difficult to support local currencies and finance their current account deficits. 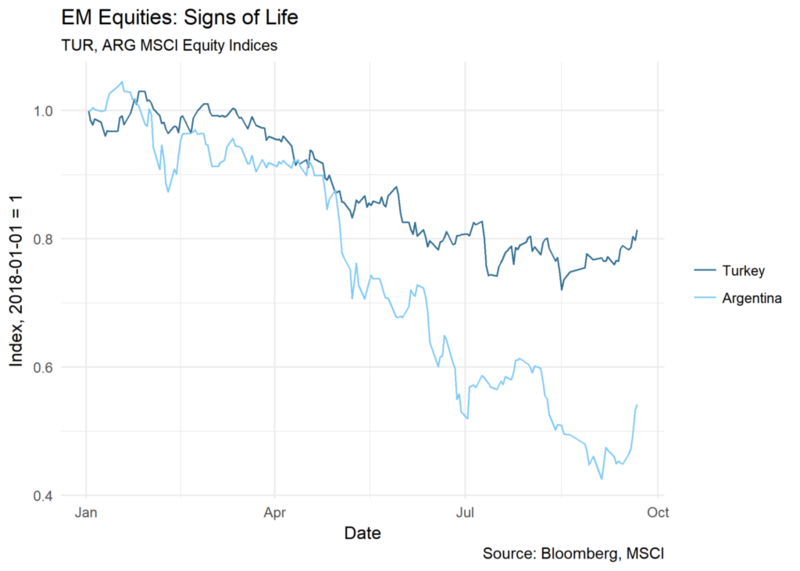 In aggregate, however, it appears that fundamentals are on slightly more solid footing than recent speculative attacks would indicate, leading some analysts to speculate that the sell-off may have been overdone. The majority of Argentina’s financing needs for the fiscal year have been covered, and IMF assistance will go a long way to stabilizing FX reserves and the country in the near-term. In Turkey, the current account has closed significantly, and the CBRT has been freed to make a greatly overdue rate hike. Nonetheless, the years ahead promise a painful adjustment. That which is bad for some is good for other. Cui bono? Many macro funds have welcomed the return to some semblance of volatility outside of the US. Much of this reinforces the obvious for investors: static exposure to emerging markets is a recipe for disaster. Instead, a quantitative, systematic approach to evaluating economic fundamentals on a country by country basis and dynamically allocating to each is a sounder basis for investing.